How thoughtful is Jesse James? Let me just get this. Cheating with this while still married - no heads-up. Deciding to get married to six months girlfriend Kat Von D after completed divorce - heads-up. Right. Mind blowing, I guess. Thank God Sandra Bullock has her mind set between changing diapers and Ryan Reynolds muscles. "You know sometimes the public and press gets it wrong. This is one of those times. 2010 was actually the best year of my life because I fell in love with my best friend. An amazing woman who stood behind me when the world turned their backs," Jesse told the mag. "I have never met anyone so kind and loving and committed to making the world a better place every day," he continued. "My love for her is beyond description. So honored that she said 'yes.' "
You're right, we've turned our backs on you and now I'm gonna reach for the toilet-paper and flush you. 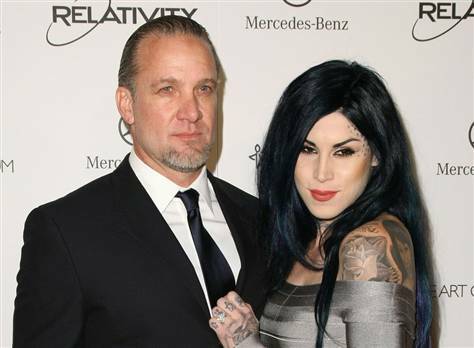 Well, I've read somewhere this comment from Jesse's former lover Michelle "bomshell", a sort of advice to Kat Von D: "once a cheater, always a cheater". A surprisingly wise comment, by the way. Let's count the months this will last.